The Scoop by Apple Cookie & Chocolate Co. If you are wondering what to get your employees, clients or business associates look no further. We will break down the top gifts from Apple Cookie & Chocolate Co. that will be remembered for it's unique idea and delicious goodies! Best of all each gift basket is made specifically for various industries making the gift a great marketing tool for you business! Each of these corporate gifts can be customized with your company name and logo! Everything is baked fresh and without preservatives the day it is shipped. 1. 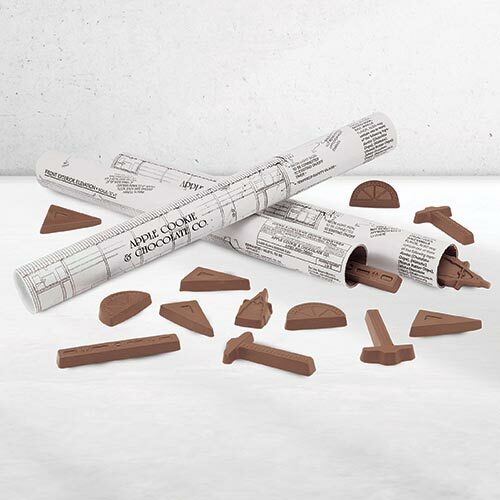 Chocolate Architect Plans- These are an oldie but a goodie! Your plans and designs have never been so sweet! An architect's drawing filled with premium chocolate T-squares, triangles, compasses and protractors. Have a special project coming up or a featured project of the year? 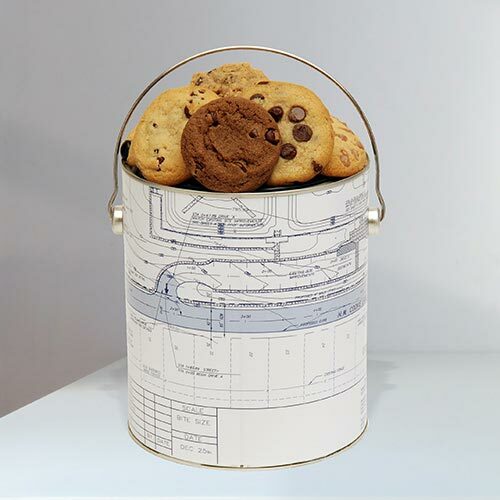 Let Apple Cookie & Chocolate Co. customize the plans with your drawings! 2. Engineer and Designer Cookie- You cannot go wrong with cookies for the holiday! Filled with over 2 lbs of soft fresh baked chocolate chip or assorted cookies, these tins are always a favorite. 3. 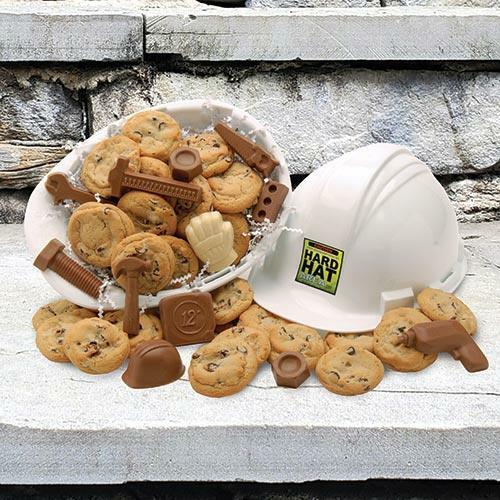 Hard Hat Full of Treats- Every architect and engineer needs at least one hard hat! This authentic hard hat filled with chocolate chip cookies and milk chocolate construction themed chocolate pieces will be the best one anyone could receive! 1. 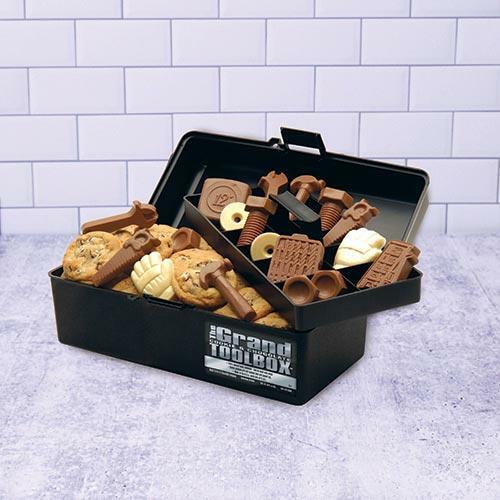 The Grand Cookie & Chocolate Tool box- One of Apple Cookie & Chocolates best sellers! The original tool box filled with cookies and chocolate tools. You can't go wrong with this gift. 2. 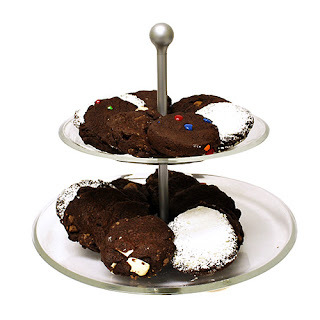 Three Tier Diamond Plate Tower - NEW- Caution this gift contains chewy chocolate chip cookies and creamy chocolate tools! These one of a kind gift boxes look like actual diamond plate. 3. Tool belt of Sweets- This canvas tool belt made by Bucket Boss is filled with all the chocolate tools you need to make any job sweet! 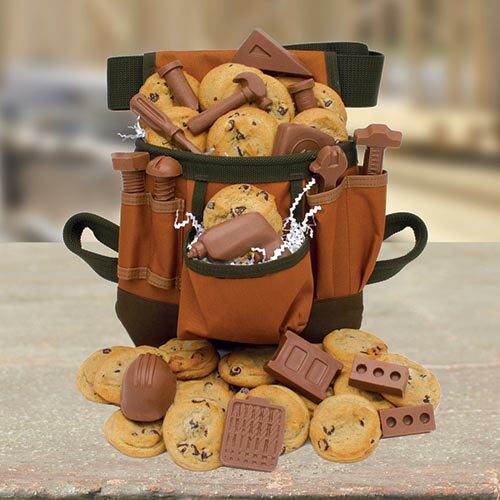 The tool belt contains a half poound of soft baked cookies and 12 oz of chocolate hammers, screws, wrenches and more! The front pocket of the bags can be silk screened with your company logo. 1. 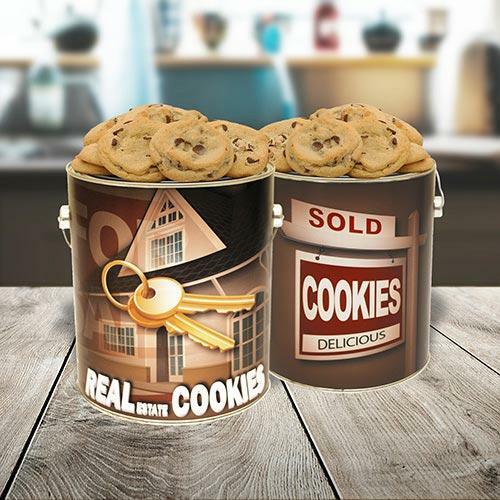 Real Estate Gallon- This real estate themed cookie tin is the perfect gift for your clients. Filled with 2 lbs of delicious chocolate chip or assorted cookies this gift idea is sure to be a hit for new home owners or tenants! 2. 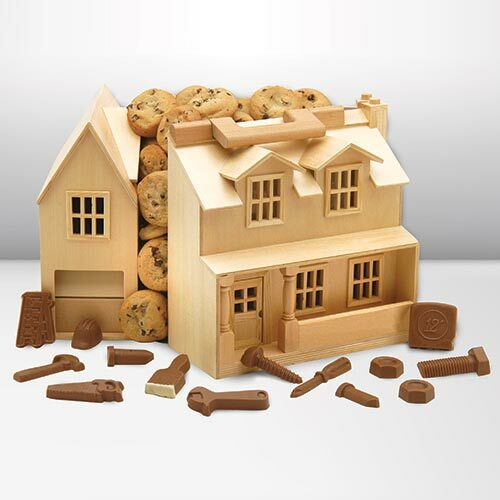 House of Chocolate Chips- There is nothing more impressive than a 11.5" x 16" x 10" wooden house filled to the roof with over 6 dozen chocolate chip cookies and creamy chocolates! 3. 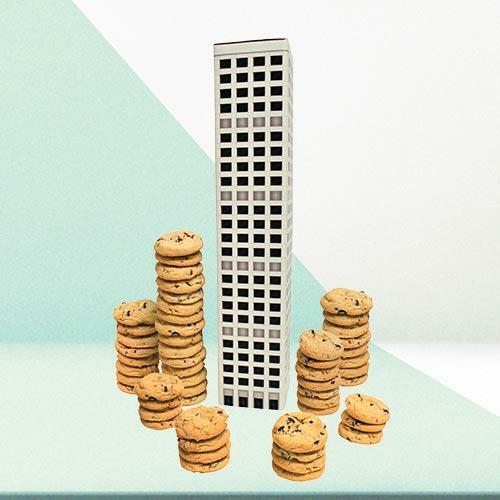 Cookie Skyscraper Gift box - NEW- This city skyscraper gift box is filled with over 2.5 lbs of delicious soft baked cookies! They make the perfect gift for any property manager or commercial real estate companies! We are happy to announce that we have been making some big changes on our website! Apple Cookie & Chocolate Co. offers endless possibilities when it comes to corporate gifts, promotions, and individual gifts! We are revamping our site so that it is easier for you to find exactly what you are looking for as quickly as possible. Stay tuned! The new site will launch by the end of April and we cannot wait to get some feedback from our customers! In the meantime, we will we will be refreshing and updating all of our social media outlets! So you will be seeing a lot more chatter from us on our Facebook, Instagram, Youtube and Twitter. So make sure you subscribe, follow, like and all that good stuff. Cool off this summer with Chilly Chips! Our delicious ice-cream cookie sandwich is made with our famous chocolate chip cookies and stuffed with chocolate chip ice cream. Visit us at our shop for some of these handmade treats or order a dozen cookies for a quick summer time DIY treat. Freeze a 2 pack cookie flavor of your choice for 2 hours. Remove frozen cookies and on the smooth bottom add one heaping scoop of your favorite ice cream flavor. Place the other cookie on top like a sandwich and ENJOY! Snickerdoodle Cookie and Vanilla Ice Cream – Doughy fried ice cream heaven! Father’s Day is just around the corner! Don’t forget to celebrate your favorite handyman with a gift made just for him, and Apple Cookie & Chocolate Co. has you covered. You can’t go wrong with our special the Gatemouth filled with chocolate chip cookies. After the fresh baked chocolate chip cookies are gone dad can use the tool bag for years to come. 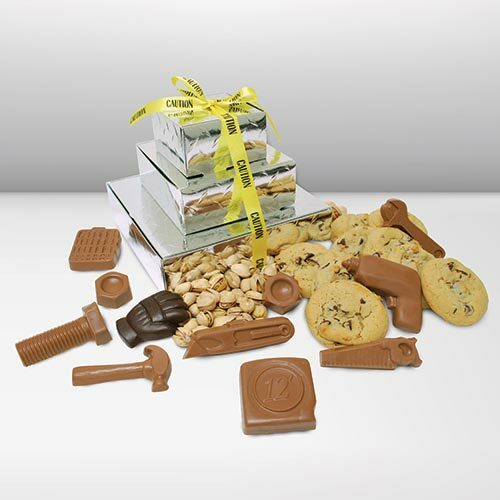 For those dads with a love of chocolate don't forget to get him the Grand Cookie & Chocolate Toolbox or the Hard Hat of Treats! Each of these great gifts are filled with delicious cookies and the sweetest tools around! The Giant Lego Filled with cookies and chocolate will also be a hit for any Lego enthusiast! So don't wait till the last minute! Get your Father's Day gift today! Our Apple Cookie & Chocolate Co. trade show crew had a blast Last week at the AIA Expo in Philadelphia, PA. We were undoubtedly the sweetest booth in the convention center offering give-a-ways including chocolate chip cookies and chocolate tools. We were also very excited to introduce our newest items as well as featuring some of our classic top sellers. 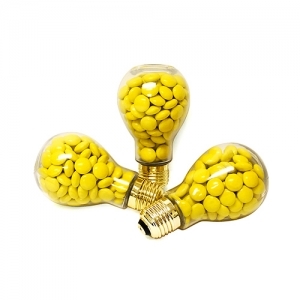 As predicted one of our show stoppers was the Bright Idea Light Bulb! This 4-inch light bulb is filled with 4 oz. of illuminating candy coated chocolate. Though perfect for anyone in the lighting industry, this gift is also a great advertising tool to introduce a new product or service! A deliciously clever way to introduce a bright idea that no one will ever forget. Other new items included our ever popular Lego Gift Box and Job Box filled with sweet tools! It was great to receive positive feedback and we look forward to featuring each of these items in our upcoming catalog. Speaking of catalog, stay tuned! We are planning photo shoots and getting ready all summer to launch our 2016-2017 edition Labor Day weekend. The verdict was unanimous: brownie cookies are a game changer! All the gooeyness of a brownie in convenient cookie shape, what’s not to love? This is the ultimate treat for any brownie connoisseur or chocolate lovers. These sweet treats make a great Valentine's Day gift! Sign your special valentine up for a monthly subscription and share the love all year! Valentine’s Day is time for flowers and chocolate, that’s a no brainer, but what do you get for the man in your life? 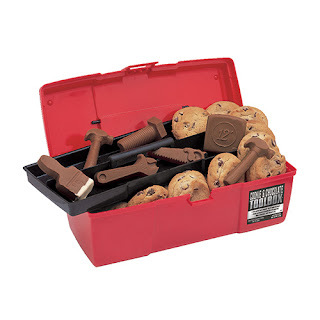 A Cookie and Chocolate Toolbox is the way to a man’s heart just as roses are a way to a woman’s. Apple Cookie & Chocolate offers a wide variety of sweet gifts perfect for any man in your life! 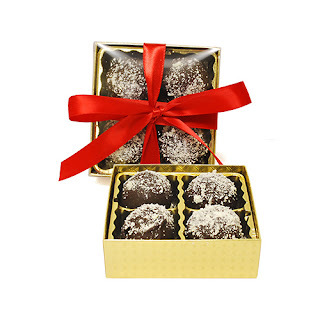 Pair one of the limited time only Truffle Gift Box’s with a Hard Hat of Treats for the ultimate Valentine’s Day gift. There are hundreds of gifts to choose from made fresh daily for your special someone.